When HBO canceled its flagship sports show, Inside the NFL, in 2008, then-host Bob Costas publicly deemed it a “boneheaded” move. The network avowed that their decision was based on a changing marketplace and growing competition from ESPN, NFL Network et al. Skeptics wondered aloud if they were merely reticent to ante up and continue licensing content from NFL Films. Whatever the real story, it’s hard to argue that over the long run, HBO’s loss was purely sentimental. Hard Knocks has become an even more high-profile staple of their original productions. It also still benefits from the hi-def realism of NFL Films and fits tidily within the premium-cable goliath’s current primetime rubric. That’s not to suggest, however, that one network’s superfluity of riches can’t become a rival’s asset. 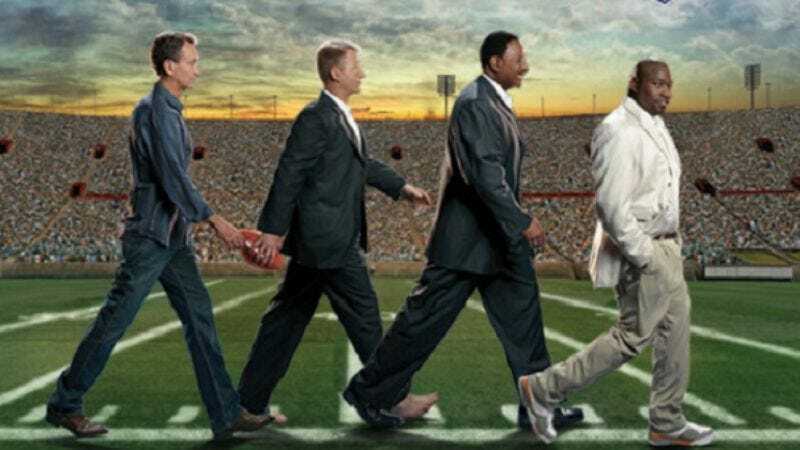 This is Showtime’s fourth season broadcasting Inside the NFL, and they’ve surrounded and lead into it with more comparable programming, like this summer’s San Francisco Giants expose, The Franchise (however understandably dubious that experiment may have been to critics like our own Claire Zulkey). Increased activity within the Showtime Sports brand means increased awareness of Inside the NFL, and waves of football fans burnt out on Merril Hoge and Chris Berman over at a certain Connecticut-based sports behemoth may just come back to the fold. And they should. Tonight’s premiere delivered what anyone could really want: superb highlights from this year’s abbreviated training camps and last season’s action; the contrast of Chris Collinsworth’s in-game smarts and Warren Sapp’s charismatic directness; and thoughtful, a-one segment producing, especially under the circumstances of a melodramatic spring and some of the hosts’ own commitments to participate in tomorrow’s opening kickoff between the Green Bay Packers and New Orleans Saints. The opening few minutes dragged a bit with some canned banter between Collinsworth, Sapp and their co-panelists James Brown and Phil Simms. Most of it fixated on witless, rehearsed jabs at Sapp having graduated from the recently besieged University of Miami program. Even when it seemed spontaneous, that only made the repartee more awkward. But amidst all this, the lockout itself was hardly discussed, a very wise choice that show staff no doubt belabored in early meetings. All four hosts had their say about how it would affect opening-week action, and Sapp in particular astutely pointed out that the collision of more stringent contact regulations and shortened July practices means bad tackling will be epidemic at season’s outset. Probably for the best that proceedings moved on toward more serious matters. The next segment featured a brief, tactful collection of sounds and visuals from the first week of NFL play following the 9/11 attacks. The media’s coverage of its 10th anniversary has been deafening, and it’s all beginning to numb. But to Inside the NFL's credit, they exercised the kind of discretion you’d almost never see on Sportscenter or NFL Live, who are no doubt hustling for teary, sixth-degree testimonials with tangential football connections as we speak. And from a football perspective, as with many of the reflections across baseball, it was strange to see the faces who were on-field that day─Vinny Testaverde QBing for the Jets stuck out in my mind─underscoring just how long ago those events took place despite how raw it all feels. That segued delicately into a tribute to NFL Films founder and new Hall of Fame inductee Ed Sabol, who, in an eerie coincidence left unaddressed by James Brown, happened to be born on September 11, 1916. Sure, it was practically foregone that Inside the NFL would kiss the ring that knighted them, but in a week without actual highlights, it qualified as newsworthy. While it was touching to see the 94-year-old Sabol thank an appreciative audience from his wheelchair, the real shocker came from witnessing his son and NFL Films President Steve Sabol, head shorn from chemotherapy treatments due to a brain tumor. For a lot of us who grew up when Ed had already bequeathed the family business, Steve’s face as emcee for NFL Films Presents specials and videos was iconic, and hopefully he’ll remiss and carry on. Things headed toward a wrap with any longtime viewer’s second-favorite part besides game footage: the hosts’ picks and upsets for several of the upcoming Sunday’s (or in today’s NFL, Thursday-Sunday’s) more gripping contests. The Family Feud face-off approach, with Collinsworth mediating between Sapp and Simms, feels a bit tacky. And Sapp, while normally indispensable for being loose and unpredictable, sped through his insights a bit as if it were actually a lightning round. The two did at least volley some worthwhile nuggets amidst the shtick (Detroit is suddenly a threat on both sides, aren't they? ), keeping it from flying off the rails. Although as with earlier in the episode when they were asked to bestow Canton potential on 2011 rookies, having the guys even take a whiff at Super Bowl pics isn’t just premature and silly, but it's exactly what we get more than enough of from loudmouths lower on the dial. •	Sapp: “I did not have one of those Trans Ams that Erick Dickerson had going to SMU.” Ouch. •	What was up with that shot of Pee-Wee Herman and Tony Romo? •	Stop calling him Ochocinco. It does not become you. •	Shouldn’t Steve Spagnuolo already know why Cadillac Williams is called Cadillac Williams by now? •	Loved the debate about Plax vs. Braylon. Interesting stuff. •Is Seattle over San Fran really an upset? •	Great, useful analysis of how Peyton Manning’s injury could truly affect the chemistry of the Colts’ offense and defense. •	I’m not always a Collinsworth fan, but after Sapp struggled to express his feelings about 9/11, I was surprisingly moved by Collinsworth’s eloquent, tasteful reminiscence. •	Sapp on Inside the NFL staffer Lisa marrying a man named Danny Greenberg: “No Rufus? Tyrone? !” Gotta love the big lug.